Cape Don Lighthouse | Lighthouses of Australia Inc. The Cape Don lighthouse was constructed on the Cobourg Peninsula in 1917 when the Commonwealth Government realised the urgent need for a lighthouse, as the passage between the peninsula and Melville Island was a route to Darwin, but was unlit. Work began on the tower in May 1915. The tropical heat of the north was considered too excessive to use iron for the construction, and the local ironstone rock was not suitable for the formation of concrete, so the lighthouse was built from reinforced concrete using materials shipped from Melbourne. Due to outlying reefs and mangroves, materials could not be landed directly at the site, so a jetty was constructed three miles to the east, a tramway was laid, and materials were transported on trucks drawn by horses. Due to the climate and the grade, only two round trips could be made each day, and construction could only be carried out during the dry season, taking three years. The tower is 28 metres high from the base to the light platform. Concreting was completed in June 1917, and the lantern was installed ready for exhibition. A severe earthquake hit the area in August 1917, causing the structure to sway. The tower was not damaged, but 12 kilograms of mercury was lost from the pedestal bath. The optical apparatus was operated by clockwork mechanism driven by descending weights, and as the tower was so high, the mechanism would revolve for 12 hours without rewinding. The tower has a Chance Brothers lantern and originally had a third order dioptric lens, with vapourised kerosene burnt in a incandescent mantle. The 150,000 candela beam had a range of 23 miles in favourable conditions. A radio link with Darwin was established in 1937, and mail and stores were supplied by launch from Darwin every fortnight. Heavier stores such as kerosene was delivered every three months by one of the lighthouse tenders. The light apparatus was converted to a tungsten-halogen electric lamp in the early 1970s, using power from diesel generators. When it was automated in 1983, a high intensity light was installed, the first of its kind powered by solar cells. The lighthouse was also demanned in 1983. 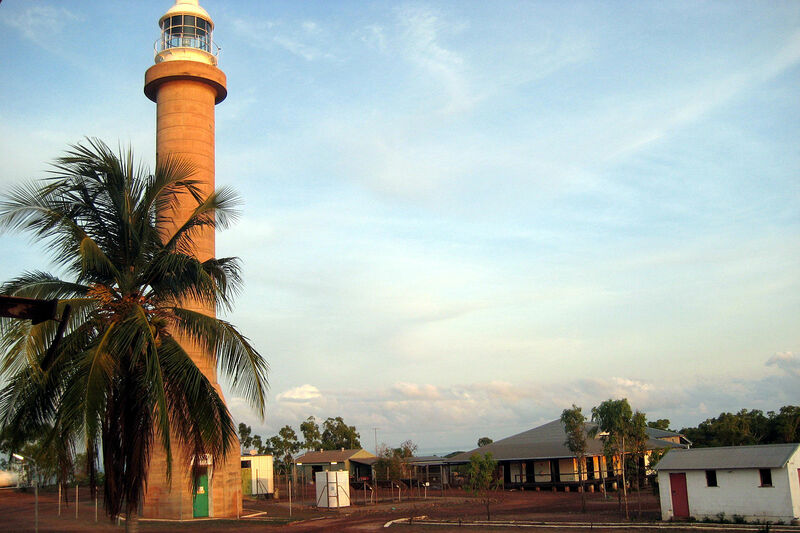 The lightstation is located within the Gurig National Park, and upon demanning, the cottages were handed over the Northern Territory Conservation Commission. Cape Don, on which the lighthouse is located, was named by Captain Phillip Parker in 1818, in compliment to Lieutenant General Sir George Don, K.C.B., the Lieutenant Governor of the Fortress of Gibraltar. Height 36 m, 28 metres from base to balcony.